The Junior Sailing Program offers basic through advanced sailing instruction to youth ages 8 and older. Instructors are certified in First Aid and CPR. Instruction takes place on the protected waters around Beaufort. This exciting program teaches the arts of rigging, sailing, and seamanship and introduces students to maritime traditions and history. It is designed to teach the basic skills of sailing to beginners and to hone the skills of more advanced students, using a combination of time in the classroom and on the water. The program helps participants develop self-esteem, responsibility, and sportsmanship, as well as knowledge of and respect for the forces of nature. An awareness of boating safety is emphasized throughout the program. The Junior Sailing Program is run by the Friends of the North Carolina Maritime Museum in Beaufort. 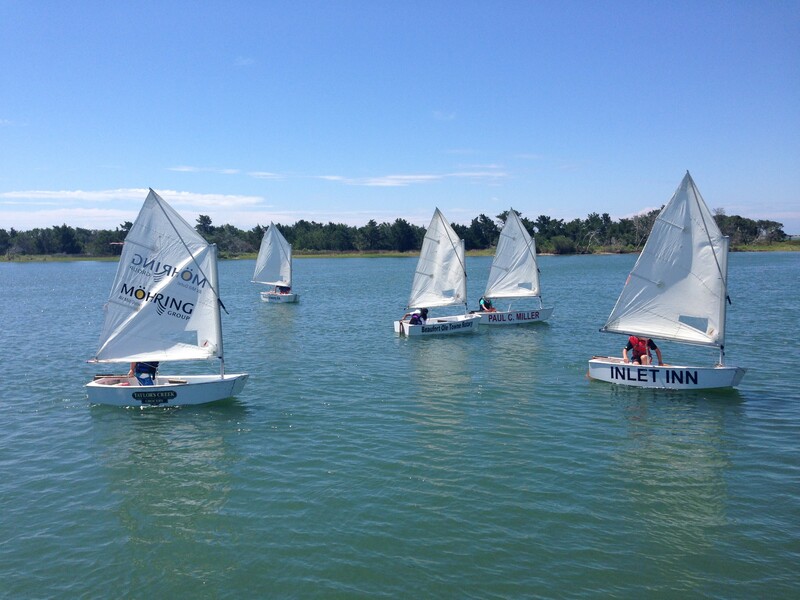 The Junior Sailing Program uses two classes of sailboats that are commonly used in sailing and racing programs throughout the US. International Optimist Dinghy. The International Optimist Dinghy (IOD or Opti) is recognized worldwide as the sail-training and competition boat for youth ages 8-15 and is the ideal craft for teaching sailing to beginners. It has a single, sprit-rigged sail and is 7 feet 9 inches long. The Junior Sailing Program uses 20 IODs, all built at the Museum’s Watercraft Center and maintained by staff and volunteers. The maximum student weight in the Opti is 130 lbs. The Flying Junior (FJ) is 13 feet 3 inches long and has two sails —a mainsail and a jib. It carries a two-person team. Each crew member will learn to rig, launch, and sail this fun and fast day sailor. Racing fundamentals, tuning techniques, and proper boat handling will be covered. The program has four FJs. 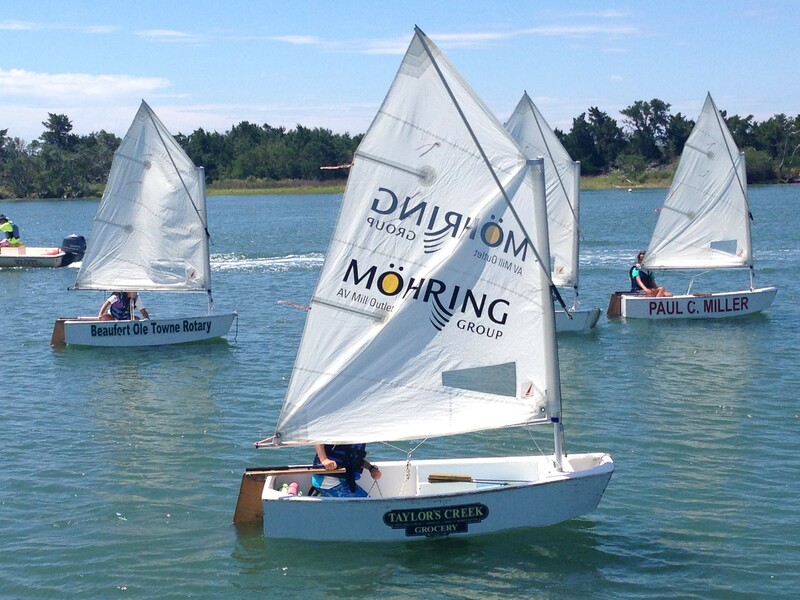 Students wishing to participate in the Flying Junior class must have sailing experience and knowledge, preferably from at least one session of the Museum’s Junior Sailing Programs. Participants must weigh at least 100 lbs. Two-week sessions for Optis and FJs are offered, with one group session in the morning from 8:30 a.m.–noon and another in the afternoon from 1–4:30 p.m. The date for these four sessions are: June 10-21, June 24-July 5, July 8-July 19, and July 22-August 2. A Regatta Week Session meets for one week, Monday through Friday, beginning August 5, from 12:30–5 p.m. On Saturday, August 10, students participate in the Hoop Pole Regatta in Oriental, NC. The purpose of this session is to gain greater familiarity with the boats and to prepare for racing in a regatta. The Regatta Week registration fee includes lunch and dinner on Saturday, August 10. A parent or guardian is expected to accompany each student to the regatta. Junior Sailing Program online registration is open. Those who do not wish to register online may call the Program Registrar at 252-504-7758 or visit the museum to register. The registrar is available Monday-Friday, from 9 a.m.–2 p.m. Payment in full will be required to secure the desired session(s). The fee for the 2019 Junior Sailing Program is $285 per session and includes a Friends of the Museum membership. Participants must be at least 8 years old when classes begin and able to successfully demonstrate his or her ability to swim. The North Carolina Maritime Museum offers morning educational activities to complement afternoon sailing. Visit the Summer Science School page for information on those activities. The North Carolina Maritime Museum is located at 315 Front Street in Beaufort. The Museum is open Monday through Friday 9 a.m.-5 p.m., Saturday 10 a.m.-5 p.m. and Sunday 1 p.m.-5 p.m. The Museum is open to the public with free admission. Donations are always appreciated. Click here to download the 2019 Junior Sailing Brochure.